COLORADO SPRINGS, Colo., Sept. 19, 2013 /Christian Newswire/ — National Back to Church Sunday® 2013 broke records again this year when an estimated 3 million people attended a Back to Church Sunday event last weekend, believed to be the highest attendance on record for the event. The effort had already broken records for numbers of participating churches. A total of 21,491 churches from all 50 states enrolled in 2013, 8,339 more churches than the prior year, representing an increase of more than 63 percent. “The campaign reinvigorated and encouraged our members to invite people to church,” reported First Baptist Penn Hills, Pa., in a post-event survey. Participating churches reported an average 31 percent increase in attendance, and 35 percent of responding churches said they had new visitors making decisions to receive Christ or to rededicate their lives. “This campaign generated a spark and forced our congregation to reach out in a way that I have not seen in many years. This is a wonderful campaign,” reported Southern Heights Christian Church, Anderson, Ind. Back to Church Sunday, a nationwide movement, seeks to welcome Americans back to church and to encourage church members to invite others to attend. Eighty-four percent of responding churches reported that having a special day motivated their members to invite family and friends. “It was a huge success and helped the church understand the importance of inviting people as well as being prepared for guests when they arrive,” Norwood Heights Baptist Church, Palestine, Texas, reflected. In addition, 96 percent of responding churches said they’d participate in Back to Church Sunday again. National Back to Church Sunday is the largest annual community-based church outreach effort in the nation. The campaign empowers churches and church members with the tools they need to welcome their neighbors, friends and loved ones back to church, while providing an easy way for everyone in the community to find a welcoming church. It started as a result of survey research that indicated 82% of people said they would attend church if someone they knew invited them, but only 2% of church members were inviting people to come with them to their church. More information is available at www.backtochurch.com, where churches can sign up now for Back to Church Sunday, scheduled for Sunday, September 21, 2014. In coming months additional information about plans for the 2014 event will be added. Churches are posting their own comments and results on the Back to Church Facebook page (www.facebook.com/backtochurch) and there is also information available on the Back to Church You Tube Channel. 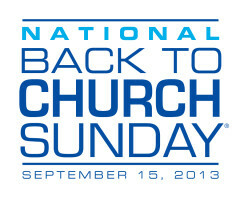 Posted on September 19, 2013, in Evangelism and tagged Church Attendance, National Back to Church Sunday. Bookmark the permalink. Leave a comment.